Want to gain valuable professional experience and leadership skills? Influence decisions that shape the student experience and the future of the University of California? Join current Student Regent Devon Graves and Student Regent-Designate Hayley Weddle to get more information about this exciting opportunity. Apply now, Applications for the 2020-21 year are due March 31, 2019. Can’t make it? No problem. 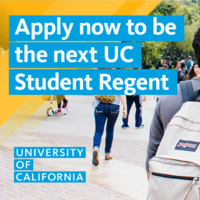 More Information, the application and FAQs are online at regent.universityofcalifornia.edu.